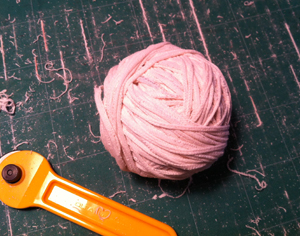 Knitting the T-shirt yarn on the 260 is possible. 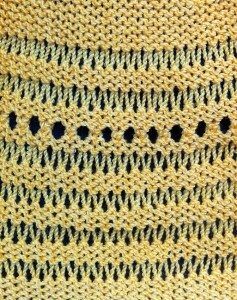 As when using any other unknown yarn it is a good idea to begin to knit with a familiar one. 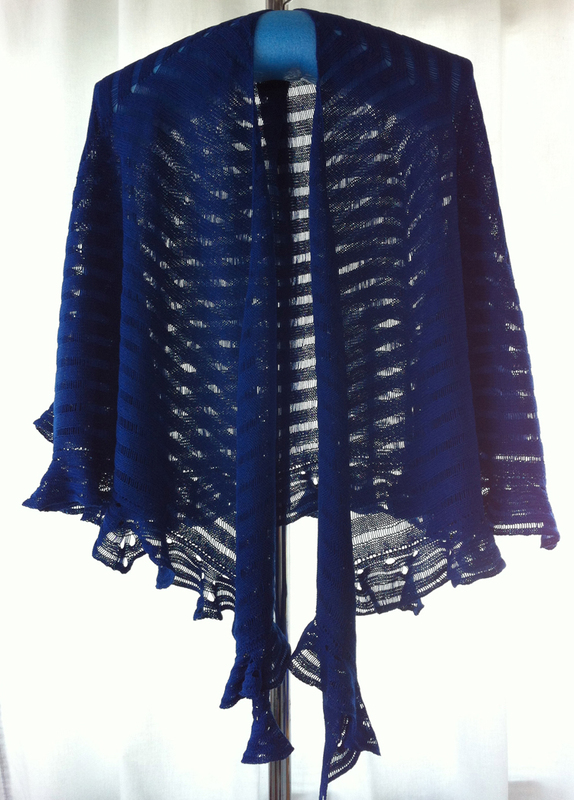 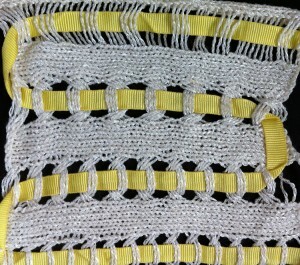 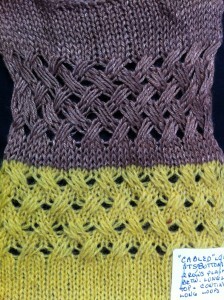 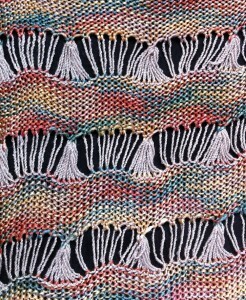 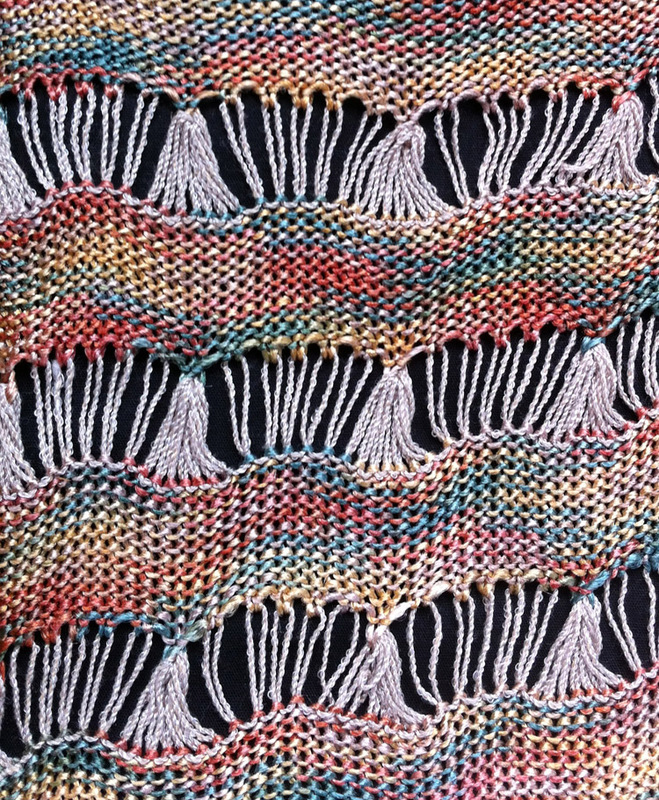 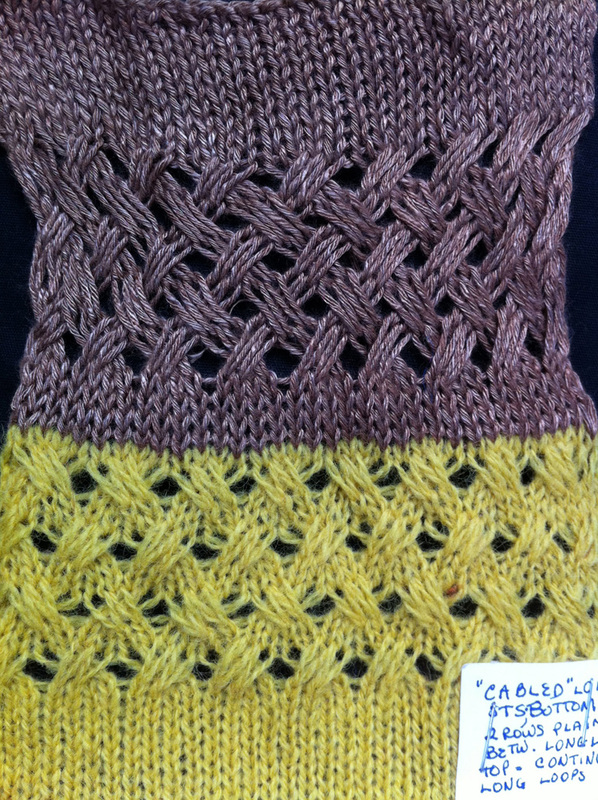 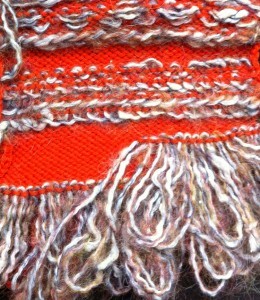 The space dyed segments are knit with a worsted weight wool. 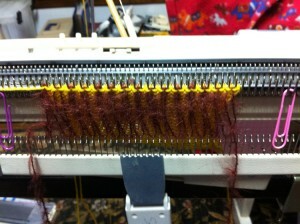 An every needle tarn knit is hard to push for both the operator and the KM, makes a wide, taut fabric. 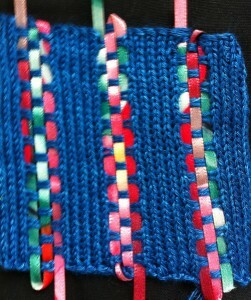 The transition multi colored stripe is to allow for transfer of stitches in use to an every other needle set up. 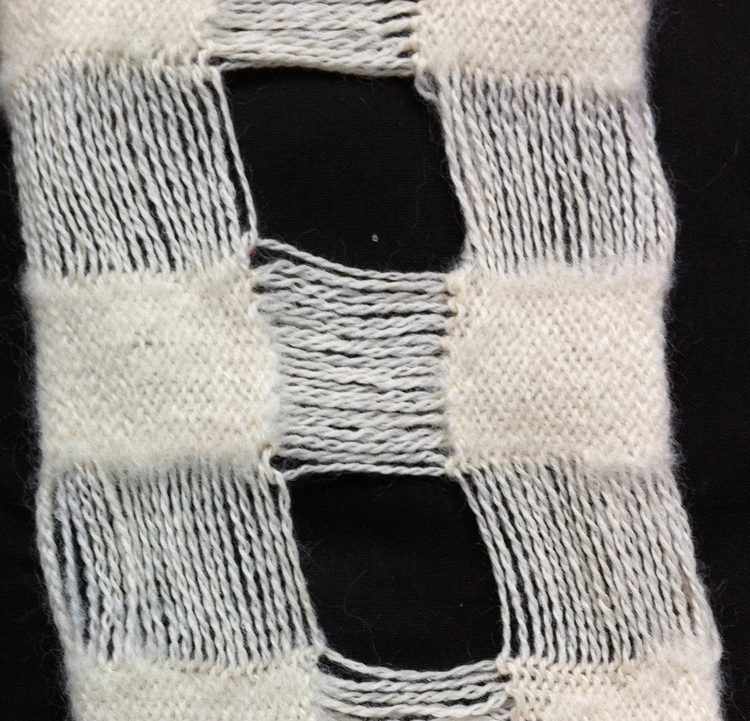 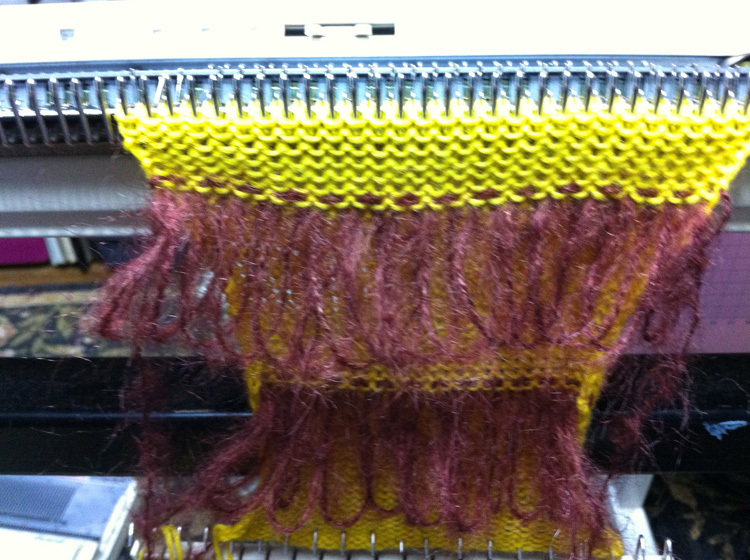 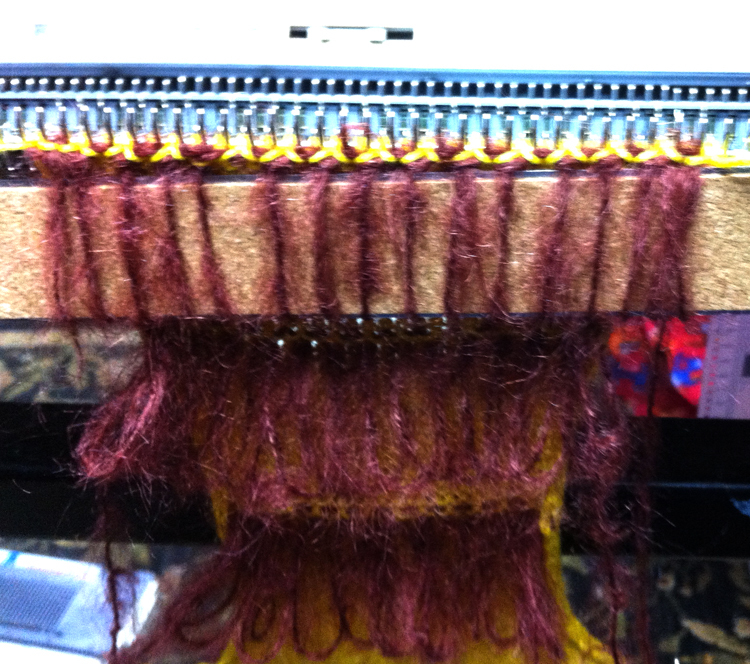 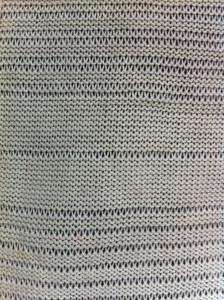 Subsequent tarn sections follow in plain knit, every other needle tucking in alternate needles in one direction, knitting in other, by pulling them to hold position, and after some plain knitting lastly by tucking on alternate EON in one direction, knitting in opposite direction, using the studio #2 card and automatic needle selection. 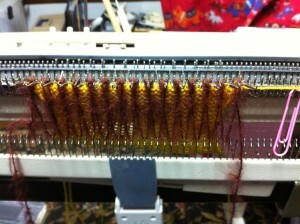 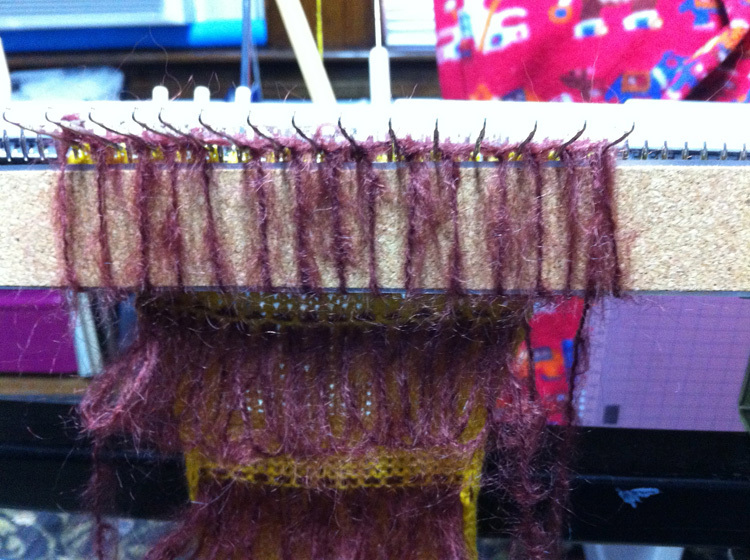 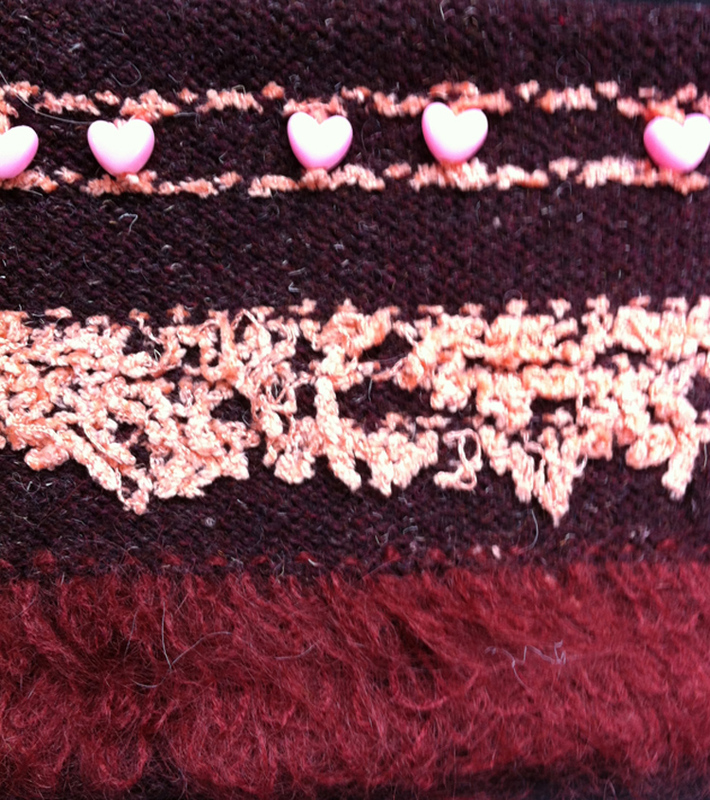 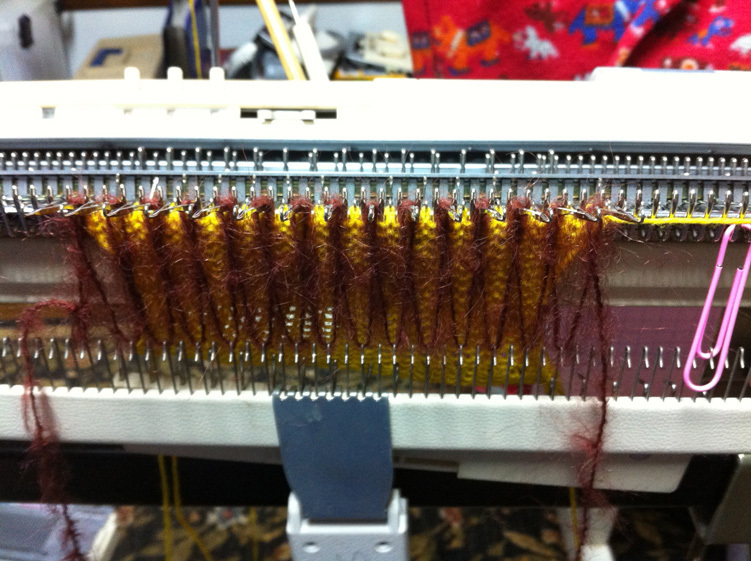 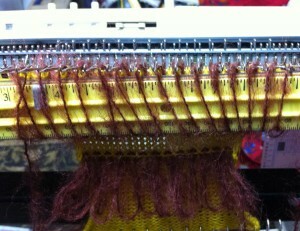 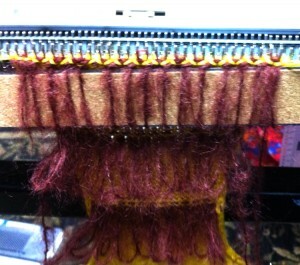 Most of the swatch is knit at T8, the very top at T4, all with lots of weight. 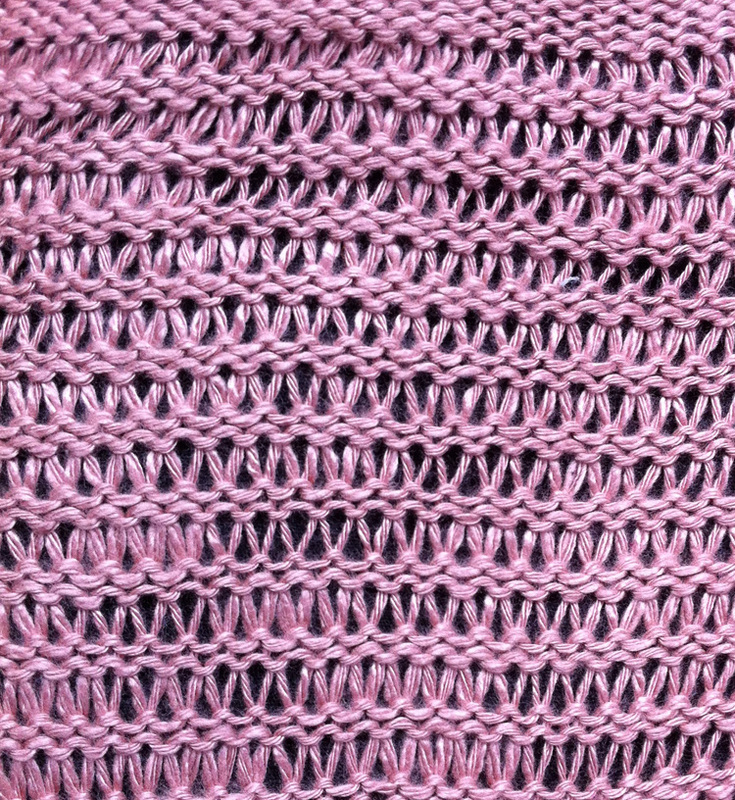 The last segment was harder to knit, is stiffer, but stitches get forced apart on the knit side, making it more interesting. 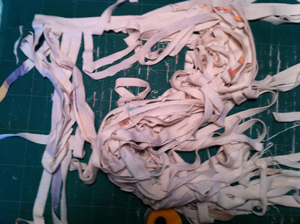 1, 2, the PDF, and video. 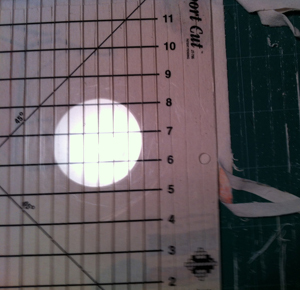 Factory “drawn” Studio mylar sheets ie for 560 model KMs will work on the Brother 910 with some adjustments. 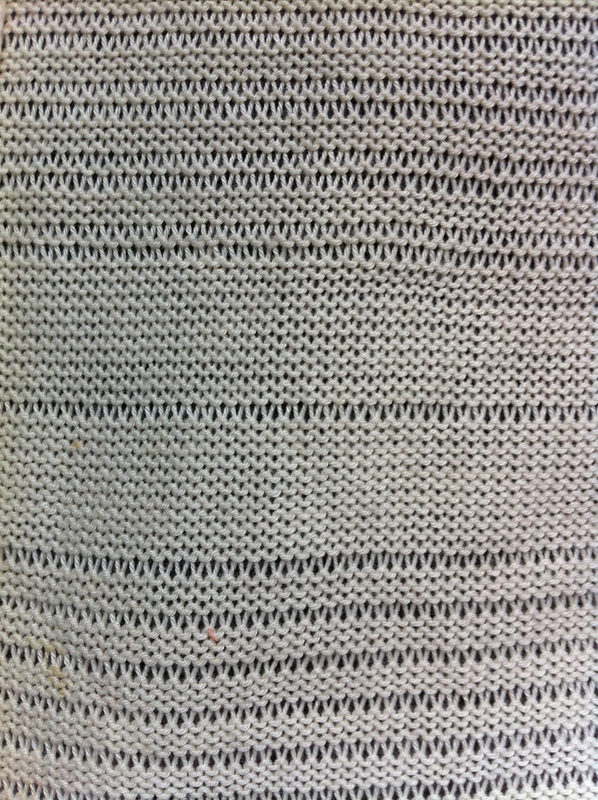 Just as when using punchcards, the card reader drum as well as the mylar scanner “see” a different row as row 1 than the alternate brand KM. 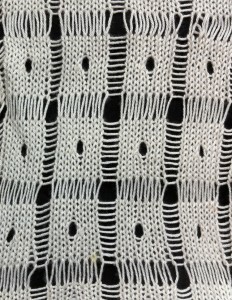 The image below is a quick scan of positions of black/white squares on Studio mylar with a superimposed, unmarked one for Brother. 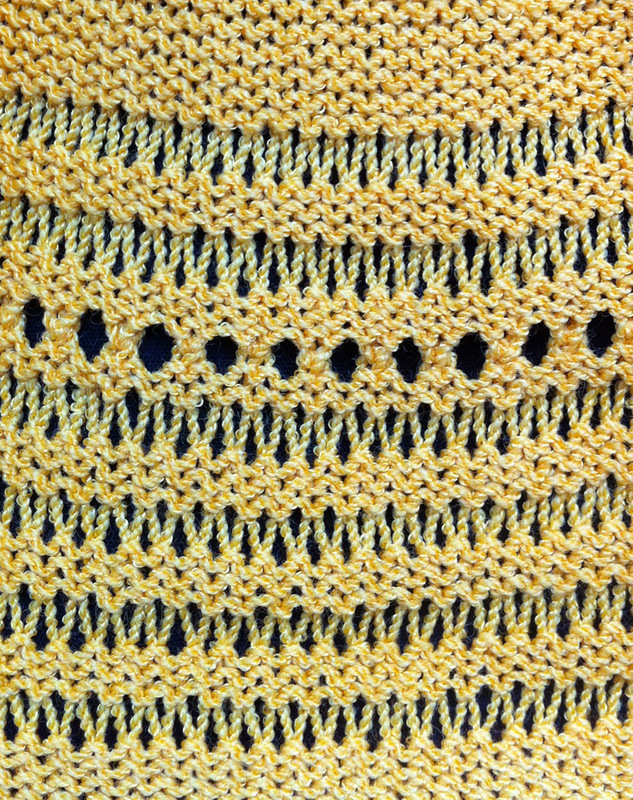 The holes for movement of the mylar occur in just about nearly the same location. 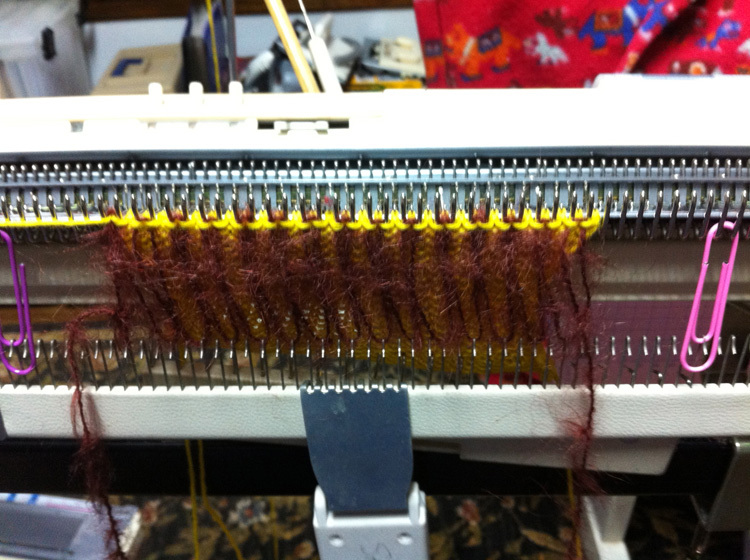 First issue at hand is to draw a set line in the proper position for brother pattern reading (traces of pencil line on the red studio mylar may be seen underneath the blue brother markings). 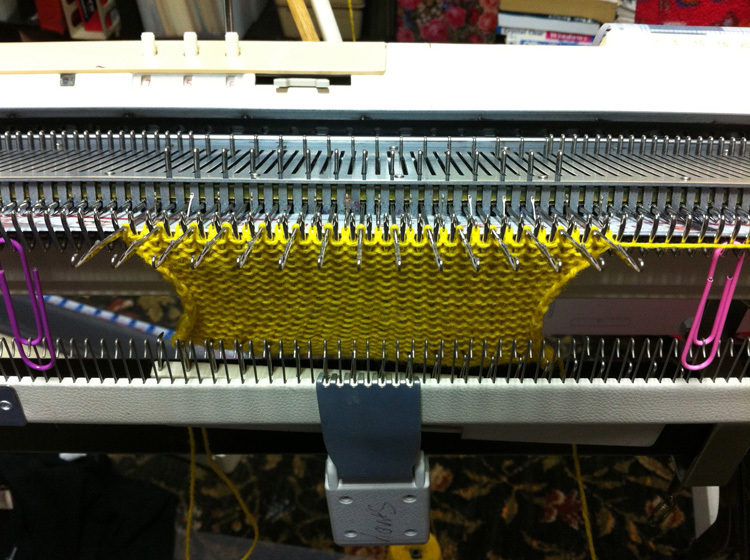 Some machines are fussier than others with set position, and I found drawing the line by placing the denser studio card over the brother one on a light_box surface made that very easy. 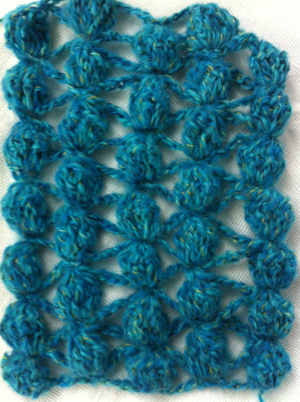 #4 pattern in Studio programming would begin on row 11, end on row 14, to program same in Brother beginning row is 14, ending row is 17; stitch locations remain unchanged, but a reminder: Brother sheet is marked in 5X5 blocks of squares, Studio in 6X5. 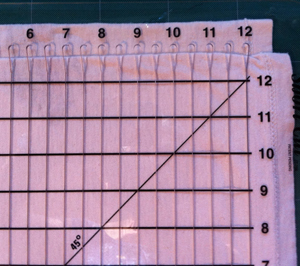 Hand drawn studio mylars when using the pencil appropriate for them will not read, so sheets need to be marked with any tools you have used for doing so in brother markings in the past. 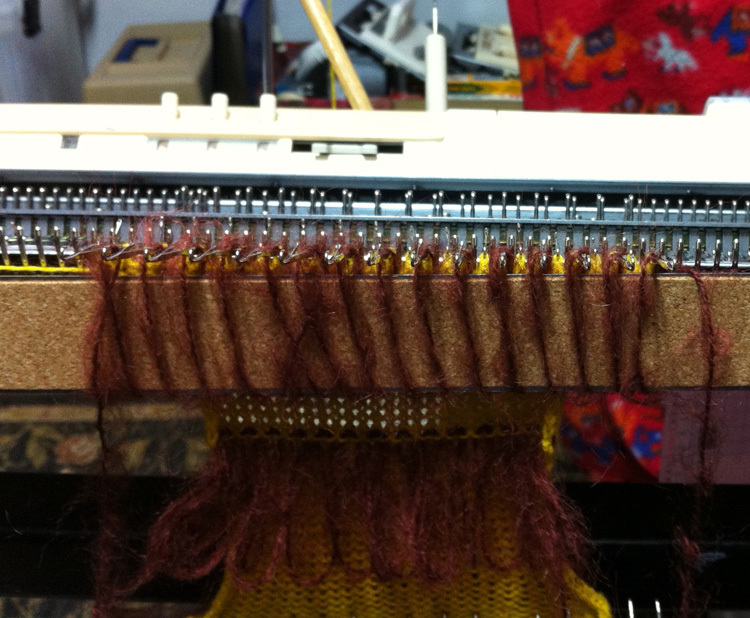 One oddity I encountered is that with the drawn repeat below I had no needle selection until I programmed rows beginning above row 5, using rows # 9-12 as top and bottom of the repeat, not an issue with the factory mylar. 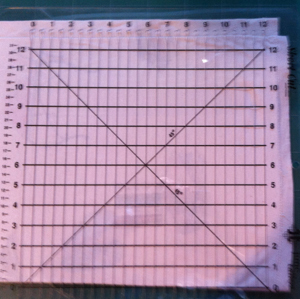 I used sharpie to draw the first pair of squares (has never worked for me), number 2 pencil on the reverse of the sheet for the second (my preferred method), and template marking pencil on the mylar front for the third. 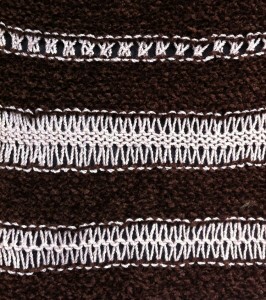 Drawing with the latter over hand drawn studio mylars enabled those markings in turn to be read by my 910. 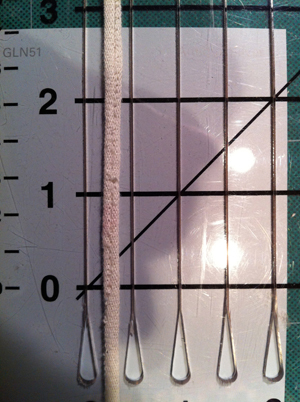 One problem with the template pencils is that small pieces of the coating they produce may shed with use. 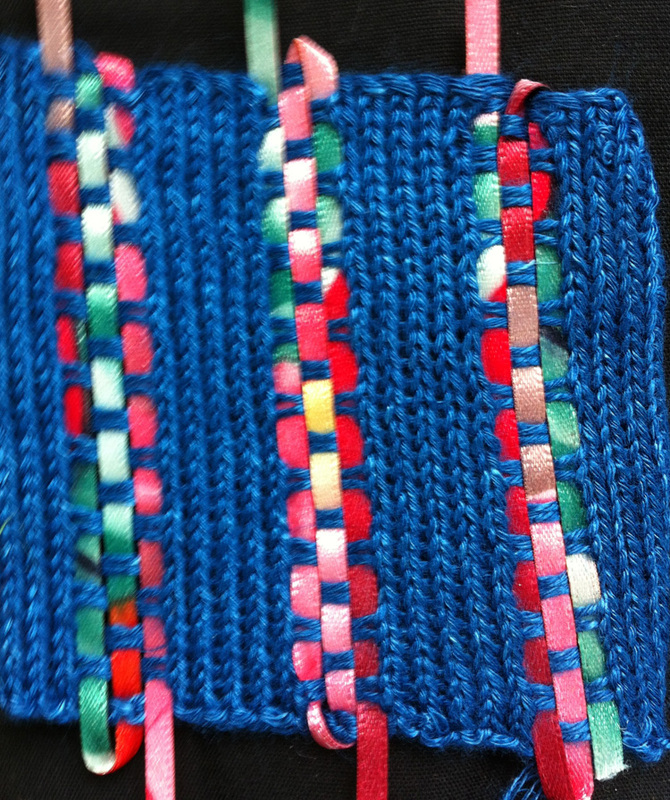 When I first shared plarn information here, I was under the impression the term applied to anything cut into strips and in turn used as “yarn” in knitting or crochet. 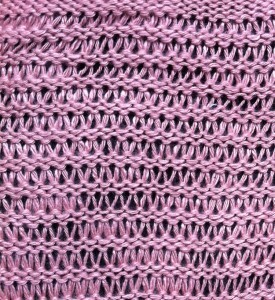 Now however, it appears the term “tarn” is in use when t shirts or fabric are used. 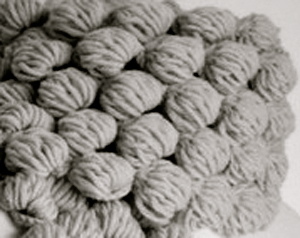 There are many ways to create tarn easily found online, including youtube videos by several authors, and even commercially dyed and prepared skeins/balls for purchase. 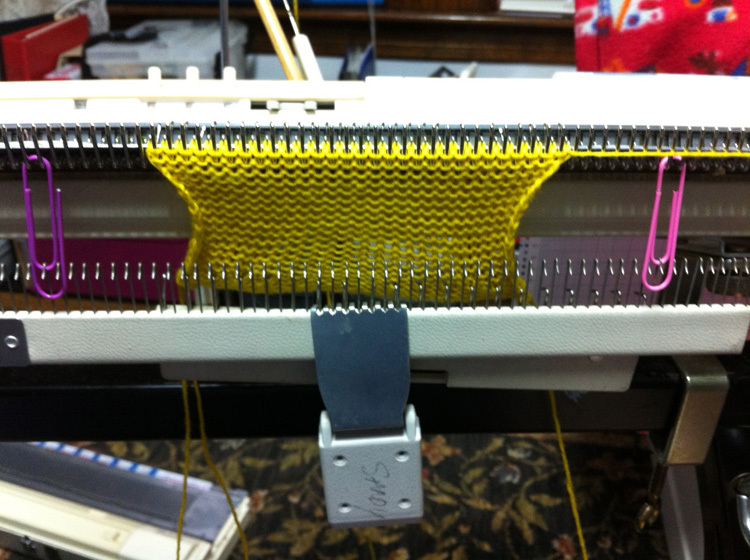 Since I machine knit, I am interested in producing “tarn” that may knit on the bulky KM, which results in limitations that do not apply if one is to knit it by hand or crochet, where needle and hook sizes are far less limiting. 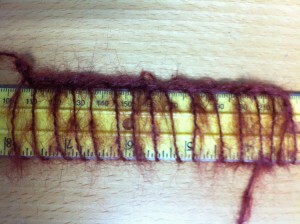 In my sewing stash of “rulers” I had one product by June Tailor which since my purchase appears to have evolved. Its closest cousin by the same manufacturer is the shape-cut-ruler. 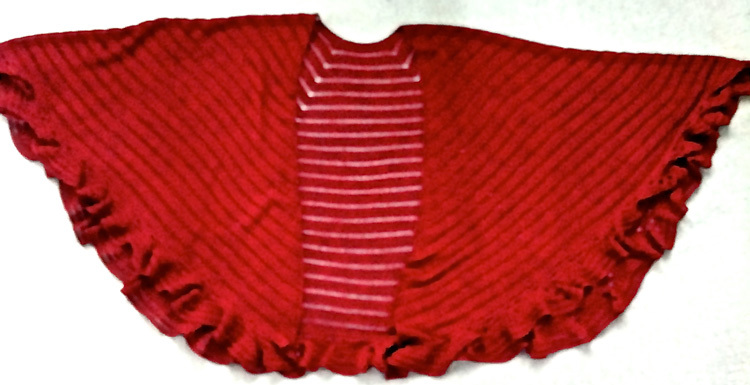 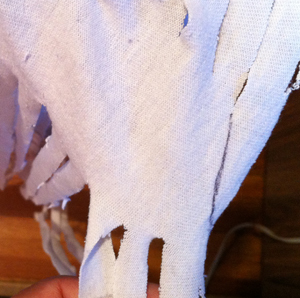 It is a convenient cutting guide which I have also used on felted wool to produce even slits for later manipulation such as chaining.In this case, I began by cutting off the sleeves and upper body from armholes to neck, resulting in a tube, which in turn I pressed and folded in half, leaving a single fold edge for later cuts to produce the continuous strip. 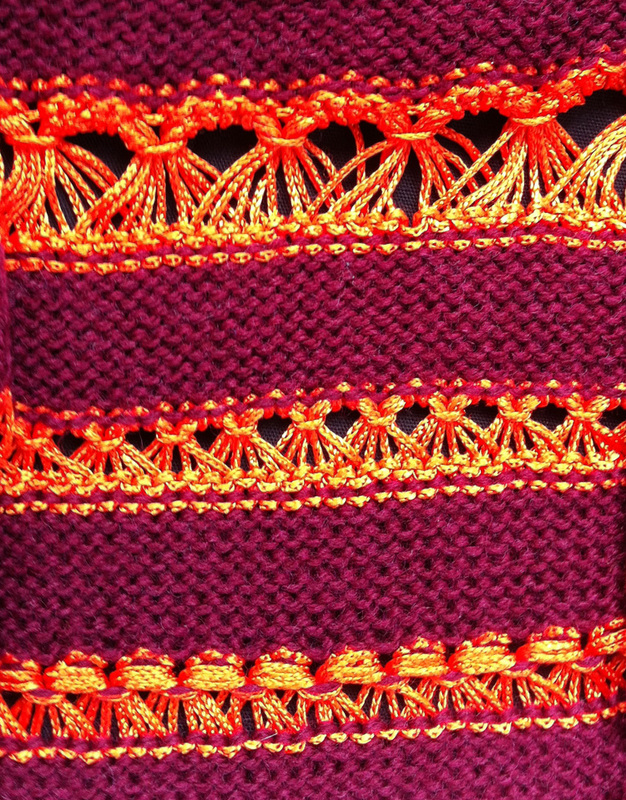 Daina Taimina’s TEDxRiga presentation on Hyperbolic Crochet. 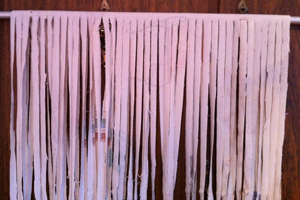 The 2 latest measure 28 inches in length, and 170-180 inches in diameter above the ruffled edge. 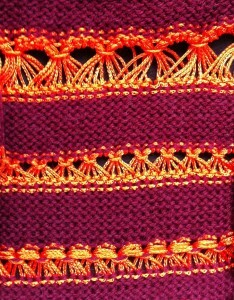 Lots of crochet patterns of late have featured chains and bobbles as components. 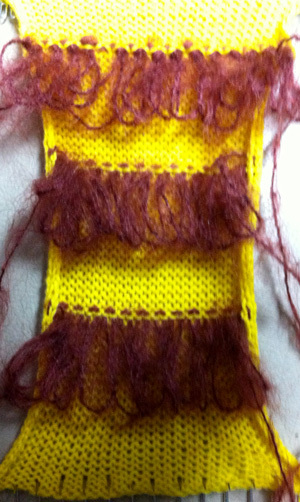 I have been playing around with an idea combining both. 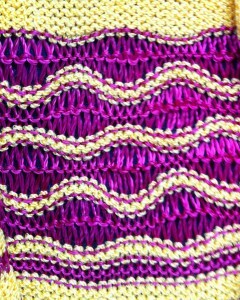 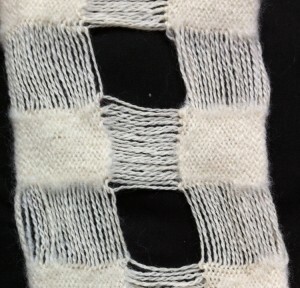 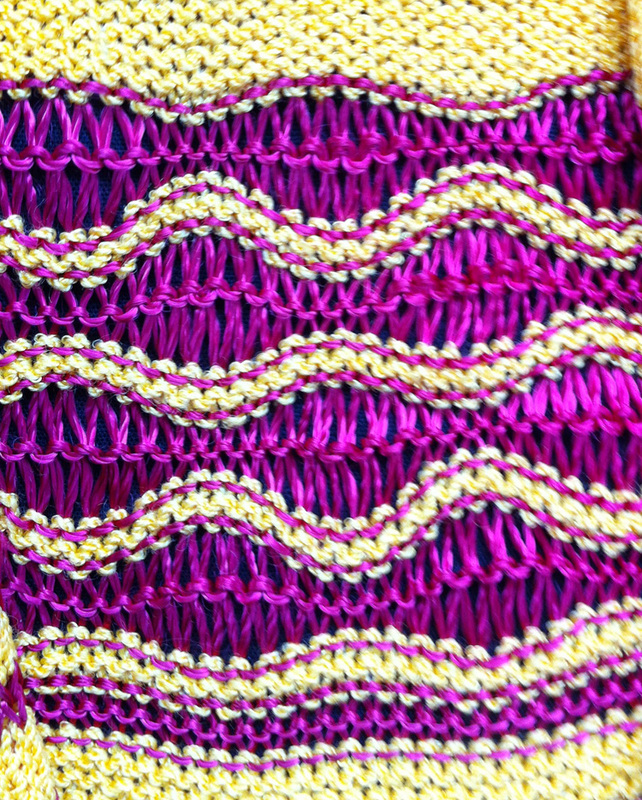 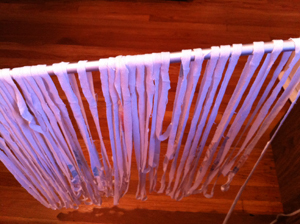 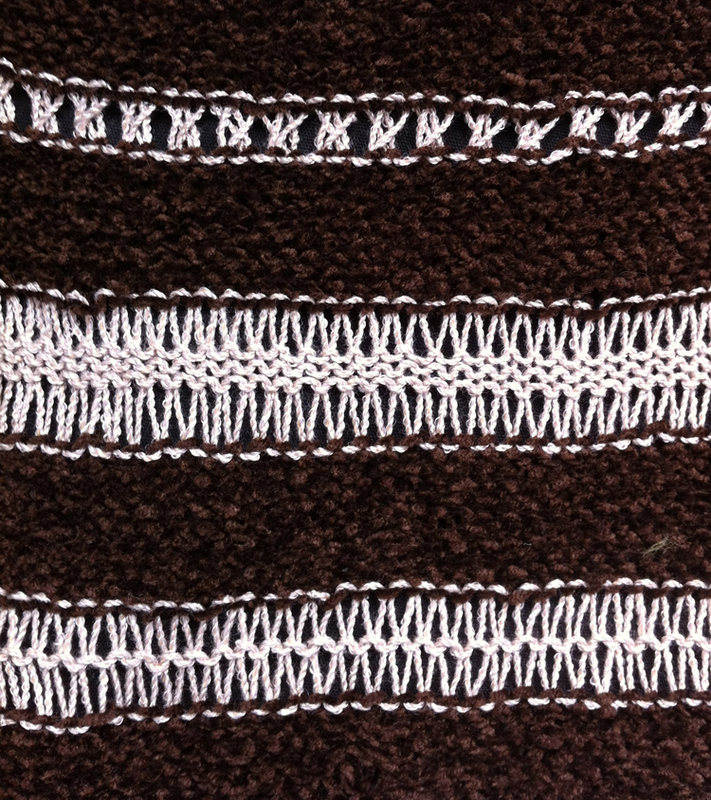 Fabric could be shaped by varying the number of chains and double crochets creating bobbles, and with very thick yarn the fabric may appear nearly solid. 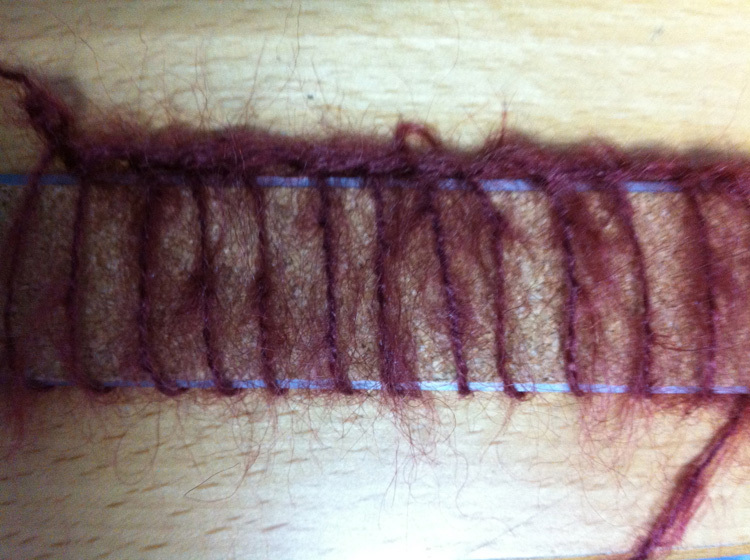 This is my working graph. 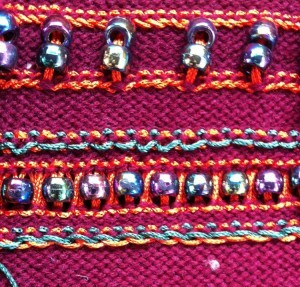 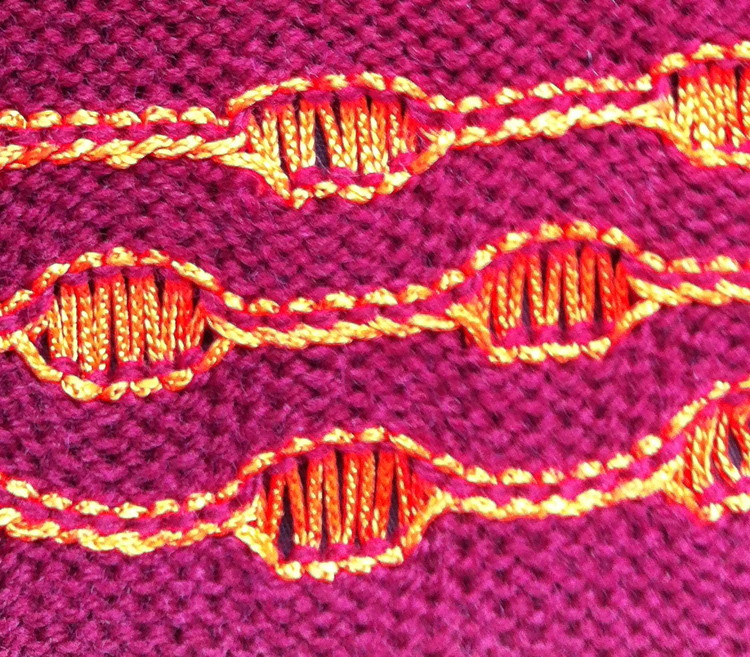 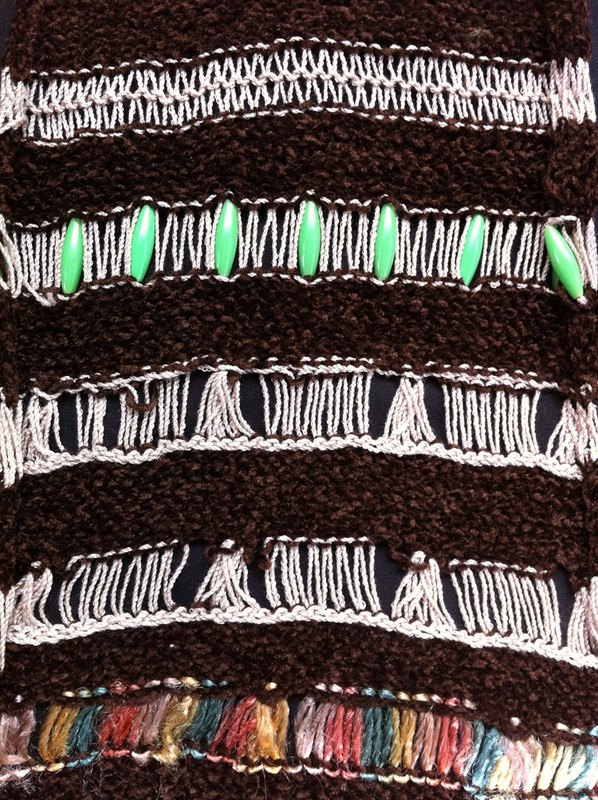 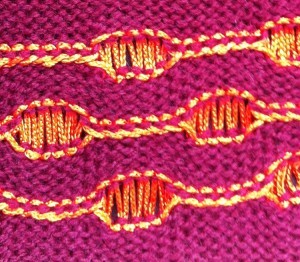 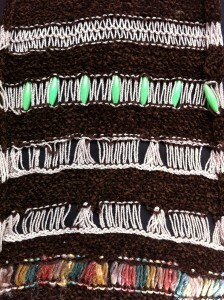 Ovals represent chain stitches, beginning at left chain is created, first bobble row is represented in red/orange; second bobble row is represented in green, crochet after work is turned over, and when the opposite side is reached, visually it will appear as though a single row of 5 bobbles has been completed. 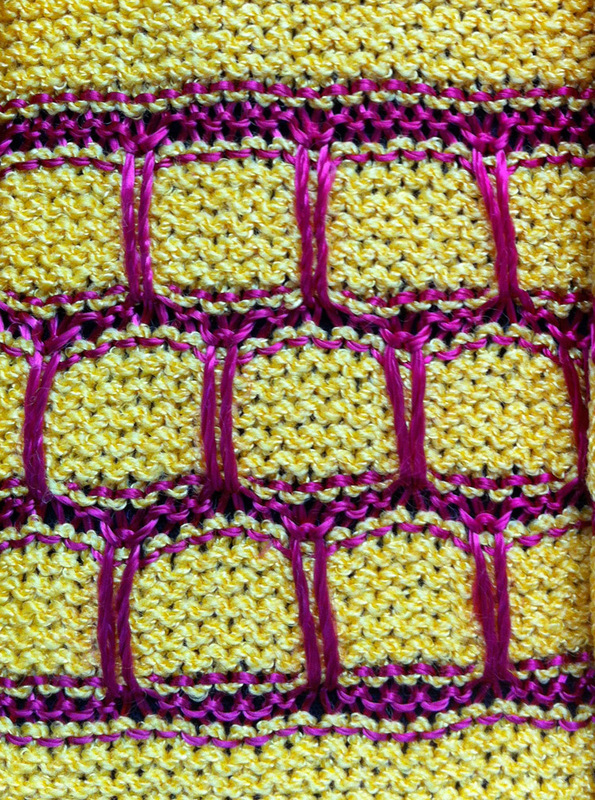 The numbers represent the number of triple crochets in each popcorn, the crosses are joining single crochets for anchoring chains to previous rows, and closing off popcorns. 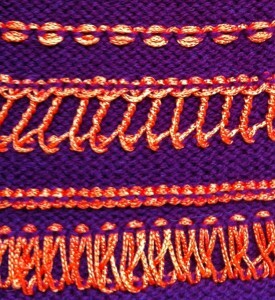 The graph was created in Excel. The yarn in use here is a very soft acrylic, intended for someone who cannot wear wool. 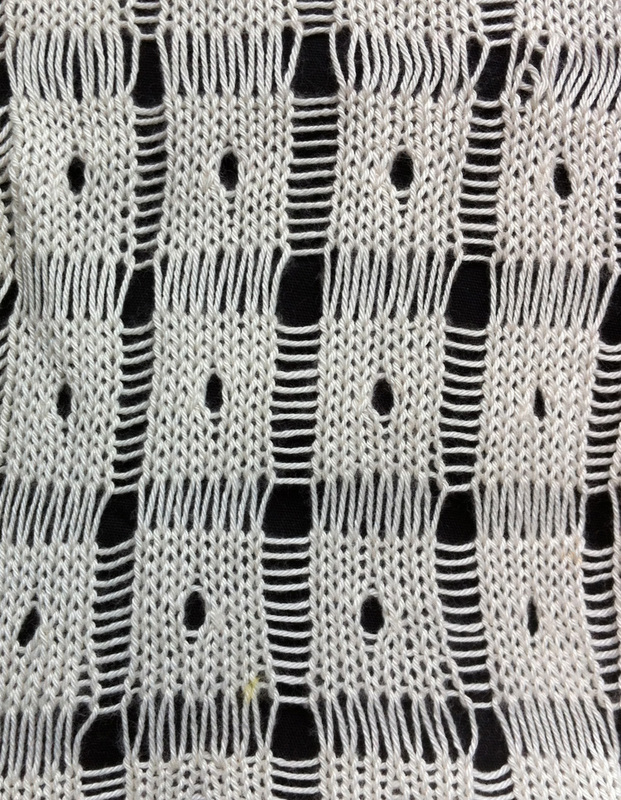 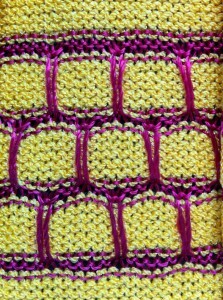 Nearly any crochet fabric has the potential to be incorporated into knit items of clothing and accessories. 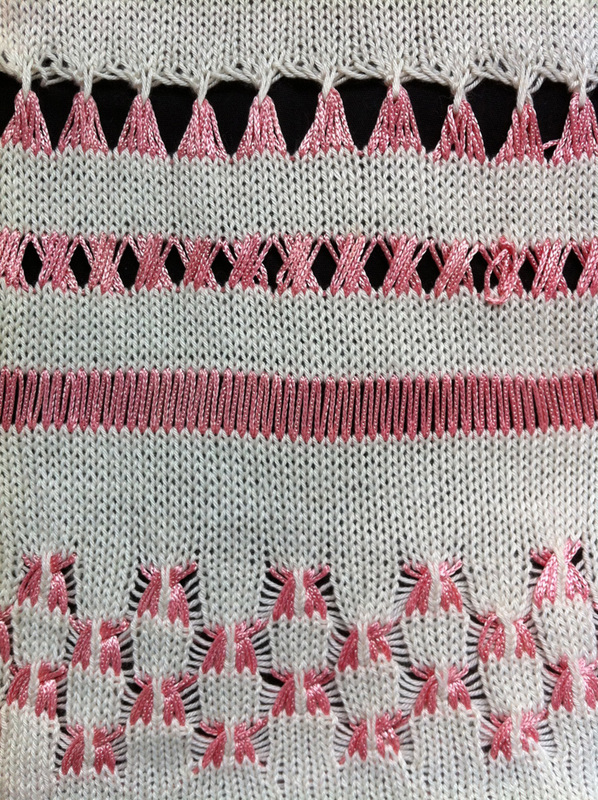 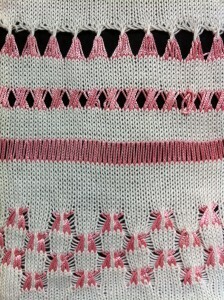 This blog “chronicles the patterns found in a late-Victorian composition book that was used by an anonymous east-central Illinois knitter as a knitted lace sample book.” The accompanying photostream. 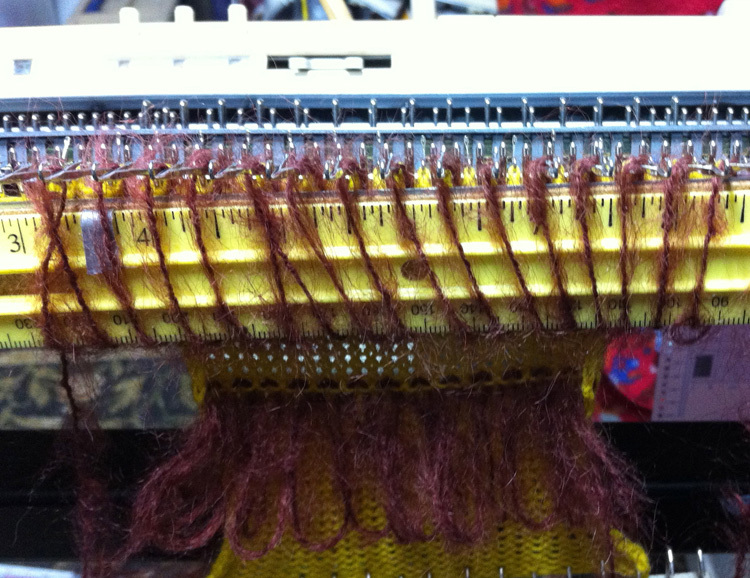 Below are some ideas for creating long loops on the machine using only the single bed. 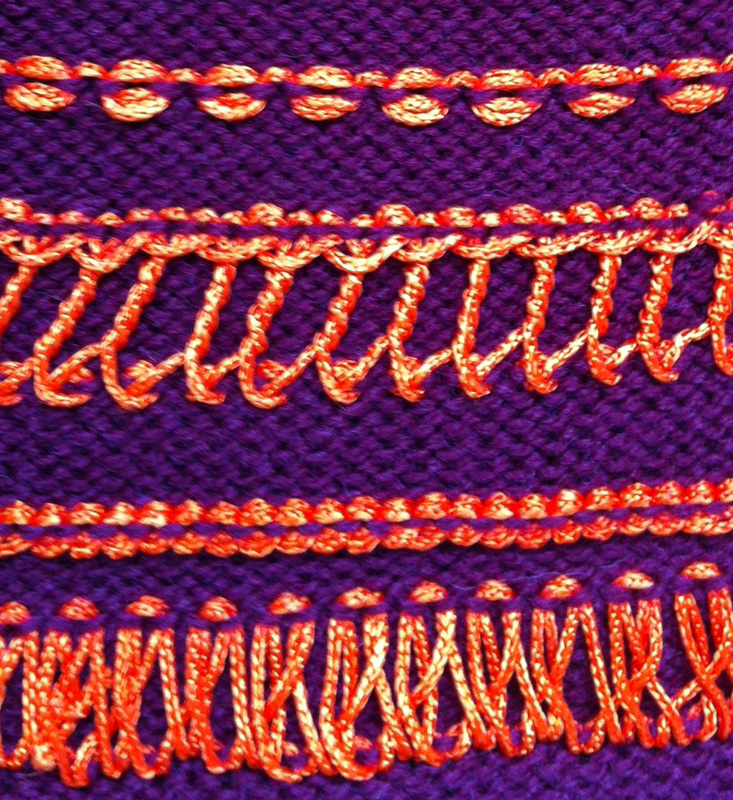 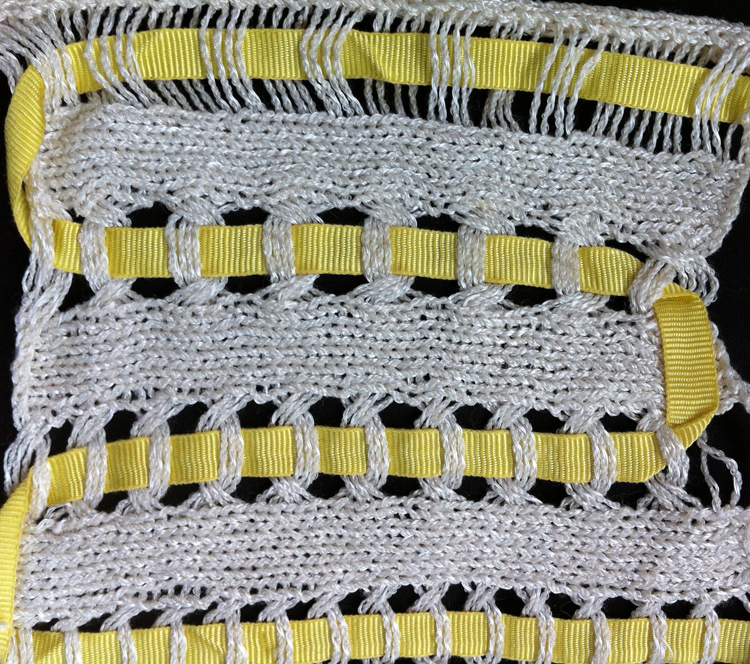 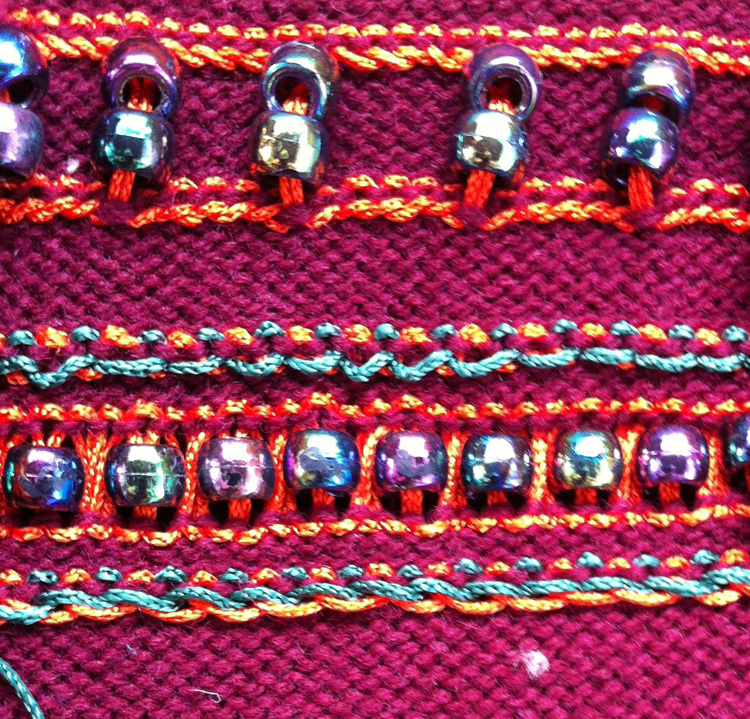 The essential difference between stitches and loops as mentioned before is that long stitches must be individually knit through the previous row, loops sit on the purl side surface. Yarn weight, loop concentration, number of looped stitches and their locations open up endless possibilities. 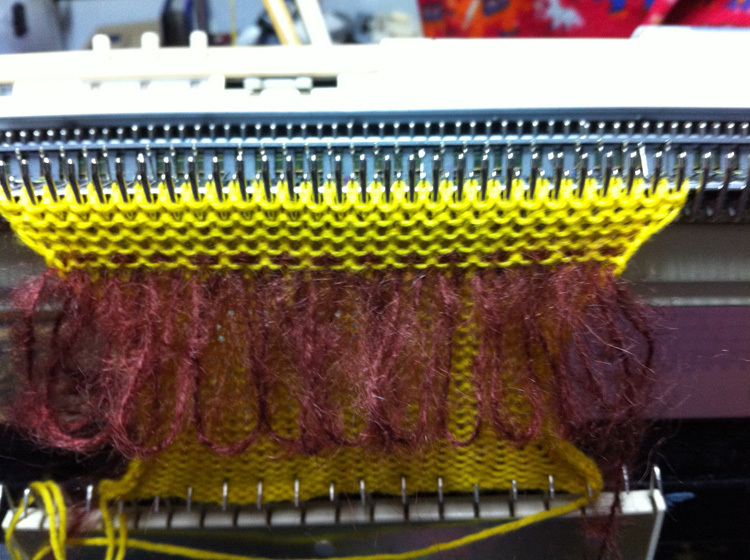 If loops for any reason are wanted on knit side, garter bar may be used to take knitting off machine and hold them, loops are formed, the piece of knitting is then returned onto machine, and continued. Swatching helps determine operator tolerance and preference as well.